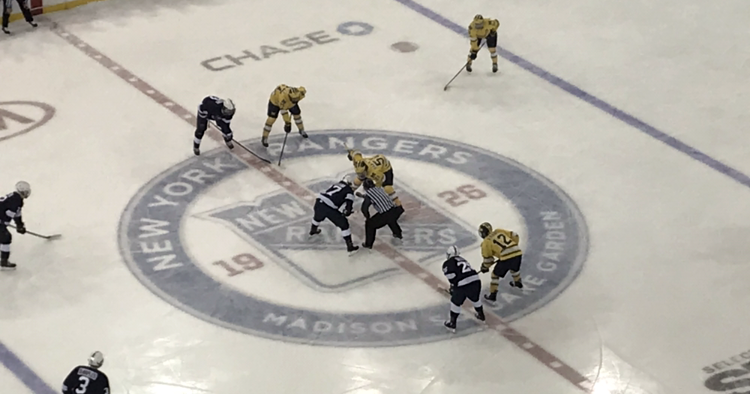 Faceoff between Michigan and Penn State. Photo by Jason Schott. 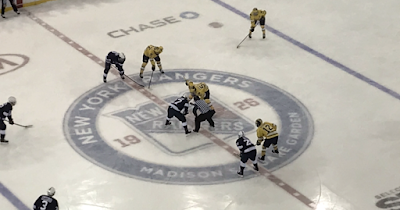 Madison Square Garden held the annual Big 10 Super Saturday College Hoops and Hockey today, with Illinois beating Maryland in basketball, 78-67, followed by Penn State beating Michigan 5-2 in hockey. The Illinois defense was stifling in the second half. Photo by Jason Schott. In the first game of the day at high noon, Illinois, who entered the day last in the Big 10 with a 1-7 record in conference play, upset Maryland, who entered the day ranked 13th in the country with a 7-2 conference record. Illinois was led by Ayo Dosunmu, who had 20 points on 6-11 shooting, including 1-3 from behind the arc and a perfect 7-7 at the free throw line, with six assists and two steals. He was their only starter to hit double figures in points. The Fighting Illini were powered by their bench, as Tevian Jones had 18 points (6-12 FG, 4-9 three-pointers) and 4 rebounds; and Andres Feliz had 15 points (5-9 FG), 6 rebounds, 3 steals, and two assists off the bench. Maryland was led by Bruno Fernando, who had a double-double with 19 points (6-9 FG) and 10 rebounds, along with 2 steals. Anthony Cowan had 18 points (4-10 FG, 2-4 threes), 5 assists, 4 rebounds, and a steal. Jalen Smith had 11 points (4-9 FG, 2-3 threes), 7 rebounds, and an assist. Maryland opened the game on an 18-9 run capped by a Serel Smith, Jr., jumper at the 11:21 mark, and an Aaron Wiggins three-pointer gave them a 30-19 edge with 5:35 left in the first half. Illinois then went on an 11-2 run over the next five minutes to pull within two. Dosunmu had nine of his 14 first-half points in the run, and they went into the half trailing 34-30. 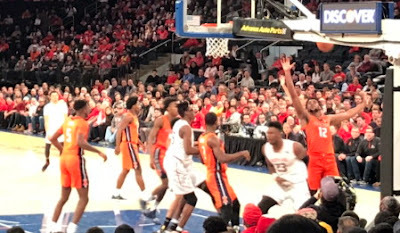 In the second half, a Fernando jumper gave Maryland a 38-30 lead, and Illinois responded with a 12-0 run capped by a Trent Frazier three-pointer at the 16:56 mark. Maryland got the lead back, and they went up five, at 57-52, on a pair of Cowan free throws at the 9:49 mark. Illinois went on another big run, this time 10-2, as Jones drained a three-pointer with 4:57 left to give them a 62-59 lead. They never really looked back, as Feliz gave them a 5-point lead, 66-61, on a pair of free throws with 2:46 left. Soon after, Dosumnu missed a three with 1:58 left, and Maryland then took forever getting a shot off, as Jalen Smith missed a three with 1:29 remaining. Wiggins got an offensive rebound, then turned it over, and Dosunmu got a fast-break layup to make it 68-61 Illinois with 1:21 left. He then hit a pair of free throws to make it an 11-point game, 74-63, with 35 seconds remaining. Dosunmu said of what it was like to play his first game at The Garden, "It was great. The feeling is indescribable. Knowing so many greats played here, so many historical events here, me having a chance to play here coming from the South Side of Chicago, it was a blessing." On his defensive pressure and what it did to Maryland, Dosunmu said, "It disrupted them a lot because we know that they only have one really main ball handler in Cowan and he's really fast in the open court, so we wanted to give them a different look. We changed defenses a lot just to make his touches hard and make it hard for them as a team and we just got out in transition and played well." Maryland was held to 44.4 percent shooting (20-45) for the game, going 10-22 (45.5%) in the first half and 10-23 (43.5%) in the second. Illinois shot 50.0 percent (13-26) in the seoncd half after being held to just 36.4% (12-33) in the first. Illinois Head Coach Brad Underwood said of the game, "Well that was a great character win fore our basketball team and we beat an excellent basketball team, an extremely well coached one. To go through the kind of year we've had and guys show up every day, they continue to work, they continue to buy in, and then to see Tevian Jones, Andres Feliz, Alan Griffin, Adonis (De La Rosa), to see those young guys contribute the way they did brings a smile to my face. It's about that locker room today. Yeah we executed, we made some shots, but to me it's a lot more about perseverance and showing up and competing. We did that today and we were fortunate to beat a very good basketball team. Maryland Head Coach Mark Turgeon said, "Obviously that's not the afternoon we wanted - wanted a different outcome. I thought our fans were terrific showing up, I thought that was great. We weren't very good, especially when the game was on the line tonight - turnovers (21). I thought what really hurt us for the second game in a row was transition defense. There was a whole halftime speech and then we gave up three wide-open threes to start the second half. That gave me a lot of confidence. We have to keep working. We have a young team. Illinois was terrific, they made a lot of plays, a lot of shots and they played better than we did today. They deserve it." Penn State celebrates a goal. 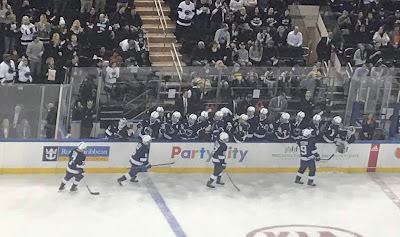 The night of hockey was dominated by Penn State early, as Evan Barratt got his 15th goal of the season 5:52 in, and then he set up Liam Folkes for his 12th of the season at the 10:54 mark. Alec Marsh made it 3-0 with 2:27 left in the first period. Amazingly, Penn State had a three-goal lead after a period in which they were outshot 22-8. It took just 1:35 into the second period for Penn State to make it 4-0 on a goal from Alex Limoges. Just one minute and 16 seconds later, Michigan got one back, as Luke Morgan scored his fourth goal of the season. Nearly halfway through the second, at the 10:52 mark, Limoges got his second of the night and 13th of the season to make it 5-1. That was all for Michigan goaltender Lavigne Hayden, who allowed five goals on 15 shots. Strauss Mann came in, and he made 19 saves the rest of the way. Michigan got a goal 3:27 into the third period from Will Lockwood, his seventh of the season, to make it 5-2. That was as close as they would get, as they were held to eight shots in the third. Penn State goaltender Peyton Jones had 35 saved to earn the win. 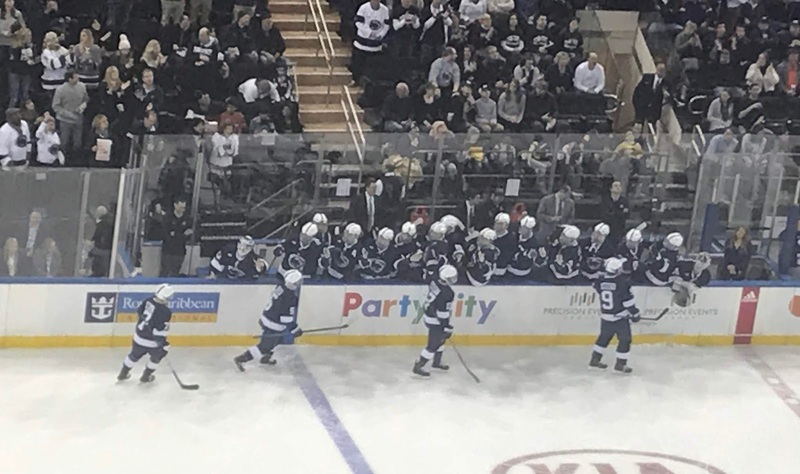 Penn State, who entered the day tied with Wisconsin for sixth place in the Big Ten, improved to 6-9-1, with 19 points; while Michigan dropped to 5-6-4, 21 points.